The days when a business used to lay down an annual sum to have its information in the paper pages, are gone. Now it’s crucial for small businesses to prominently list themselves in multiple online directories instead. Most of consumers now use search engines to find local businesses online. Near about 50% of those who conduct local searches by smartphone visit the business within same day. To make sure your business is found, you should enlist your business with the business listing companies. 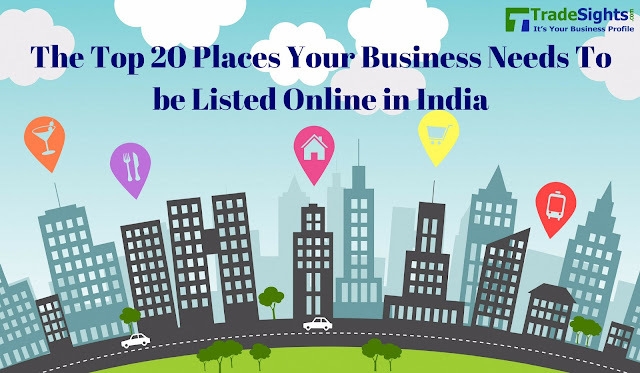 A local business listing is an online entry that contains your business Name, Address and phone number along with other detailing as well. Creating local business listings is the main work of marketing campaign for any local business. The local business listings give more visibility for your business. Every new listing that you create enhances your chances of being found online by consumers easily. The more directories that you are listed on, the more visible you should be. If your business is visible online, search engines trust the accuracy of your business data. Thus your chances of ranking up even on top for local searches increases. To simplify in short, business listings can be considered as an online version of business information. Let’s have a look into top 2o places for your business listings. Most popular search engine is Google. It is a multinational, publicly-traded organization. Google search is commonly referred to as Google web search. It is a web search engine on the World Wide Web. It handles more than 3billion searches each day. Bing is the default search engine for desktop and tablet versions of windows 8, some tablet, desktop and laptop. You can add multiple business locations, photos, videos here. Bing requires fast, free and easy registration. Yahoo local listing is ranked third next to Google and Bing. Yahoo’s service draws millions of searches in daily basis. A basic listing is free. Yelp is one of the best online sources. It allows you to send public or private messages to customers and review business trends using the reporting tool of Yelp. Tradesights.com is one of the best free business listing websites in India. A perfect registration helps local businesses to be found online via Tradesights.com. It helps to showcase your products online and to maintain the connection with your consumers easily. By getting feedback you can enhance your service-quality too. MerchantCircle is a free network targeted toward small businesses seeking to connect with local consumers and other small businesses. Even users can advertise to boost their listings, post business blogs and take advantage of free marketing too. If they are more active online, they gain more local exposure. Yellow Page is well organized online version. It offers advertising, lead generation and ad performance data in details. Company research from last year points to 70 million visitors across the app and the website. “White Pages” is enlisted among 30 million companies. It offers sponsored ad opportunities and a premium text message service for the consumers. Superpages.com is free and easy-to-navigate service that includes helpful options. That includes weather, lottery listings, as well as fact access to popular categories, search tips and so on. Yellowbook allows for easily searchable business listings that include your business information, a link to your website, product descriptions, map features, video ads and so on. YellowBot provides basic contact and location info about your business. It’s similar to Yellow pages. With customer reviews and options include premium listings, searchable tags and fast sign-in. Manta is one of the largest online resources dedicated to small businesses mostly. They deliver helpful news and advice, promotion opportunities and tools for small businesses as well. It is free site that specializes in listing for restaurants, bars, spas, hotels, restaurants and other businesses across the US. Local.com is free directory gives searches detailed info about events, deals and relevant info. Its database includes more than 16 million business listings. The combination business directory and social networking site allows users to check in via map and comment about your business with Foursquare. DexKnows is the business listing site that monitors your reviews and ratings and provides data info how consumers engage with your profile. The DexKnows mobile app is available for android and Apple both. Tripadvisor offers a flat subscription rate for any business related to the hospitality or entertainment industries. It is the world’s largest travel site. Hotfrog is free, detailed online directory that can help to get your website listed on Google Search results. Kudzu, this free database reports that it helps some 20 million homeowners a year that make decisions regarding their renovations. Profiles can include marketing descriptions, photographs of work performed, videos, coupons etc. Angie’s List is a respected site known for its objective consumer reviews in more than 720 categories. There are more than 3million members turn here to research, hire, rate and review local service providers as well.